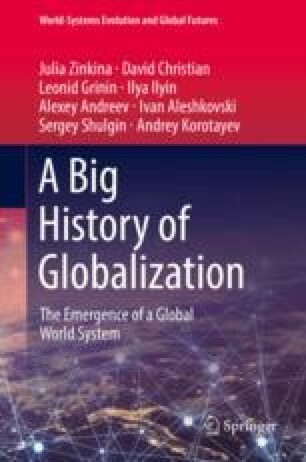 In the previous chapter we noted that globalization in the nineteenth century heavily contributed to the global spread of European modernity. In this chapter, we will focus on some of the most prominent political aspects of this modernity, which came to acquire a global character in the twentieth century. In the sphere of politics some of the most notable developments included the advance of constitutionalism (which came in three waves), the emergence of modern political parties, the spread of universal enfranchisement, the global “liberation of slaves,” and the appearance of the prototype of the modern social welfare state. Multidimensional, profound, and very fast (in the Big History perspective) modernization processes developed unevenly and frequently exposed the World System core countries to new types of traps, which could result in revolutions and periods of political turbulence. As globalization forced modernization processes to increasingly penetrate the semi-peripheral and peripheral parts of the World System, such turbulence spread across the world and generated episodes of sociopolitical instability in various modernizing countries throughout the twentieth and early twenty-first centuries.